AMCAT Registration 2019 (official Website) – All the candidates those who are pursing their graduation or passed out but somehow not able to get the job. We know, you must hunting your job badly and we are making sure that every deserving candidates gets their dream job as soon as possible. Hence, we are bring AMCAT Freshers Registration which enables you to access hundreds of jobs in your inbox. You don’t have to worry and only prepare for better interview and written exam. in this article, we are going to elaborate why it is important for you to enroll for AMCAT exam if your job hunt is still on. AMCAT Stands for Aspiring Minds Computer Adaptive Test. All the job aspirants looking for job opportunities in Top MNC Companies can register for AMCAT exam. In this article we are going to enlist steps to register for AMCAT and also we are jotting down steps on how to get discount in amcat exam with vouchers code especially given to alpingi readers/subscribers. The AMCAT 2019Registration has been started for all the candidates who is going to pass-out in 2017. All eligible and interested candidates can register for AMCAT on official website of AMCAT. First of all, before going for AMCAT registration you must check the AMCAT Eligibility Criteria. AMCAT Test is Widely Accepted by Many Top MNCs Like Cognizant , TCS, HCL, Infosys , Accenture and Many More. It is the Computer Adaptive Test which examine the candidates ability in modules Like English, Logical Reasoning, Quantitative Ability, Computer Programming and in other core subjects. All graduate candidates will get job opportunities through AMCAT Test. AMCAT 2019 registration will help all job seekers to grab jobs in IT, Mechanical, Management, Finance Sector. All Candidates wish to register for AMCAT 2019 must prepare themselves according to the AMCAT Syllabus & Exam Pattern. The AMCAT Test has been conducted online and according to current placement scenario many companies opted the AMCAT Score for the entry level jobs, so it means getting good score in AMCAT test will help aspirants to be shortlisted for TOP profiles in MNCs. The Test has 2 Modules. One Module is compulsory for all branches and Module 2 is core module for branch specific. Eligibility criteria: Aspirants Must Have Completed the Graduation or may Pursuing Final Year of Respective degree. Candidates Can follow below mention steps to apply for AMCAT Test. Fill the new registration form on the opened link. Use coupon code and get Upto 150/- discount. Note : All the Important Details regarding Freshers Jobs and Placement will be updated on this website . Bookmark this website by pressing Ctrl +D. Any Query Can be Discussed Through Comments. Hope you understood AMCAT Registration process, Please comment if any questions. We will updates the dates as they are updated by amcat official. 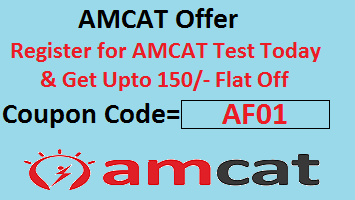 AMCAT is not free you have to pay 900 for one test,and score will be valid upto 3 years. Actually I completed my degree in 2014, now i have an experience of 3 yrs in core. How can i apply for IT sectors via amcat? Especially for Accenture. Hi my name is Mani Surekha ValaVala I got call letter from Cognizant last week but I was unable to attend the interview due to health issue .Can I get any second chance again to attend the interview ? Please call the concern dept and ask them to reschedule your interview… it might work.